When you use our website or any of our products, software or services Smart LED Concepts will process your personal data. Below you will find information regarding which type of personal data that is being collected, the reasons for and purposes of why we collect the data and your rights regarding the processing of your personal data. Respond to incoming enquiries through our support channel and web application feedback channel: Name, telephone number, e-mail address and other personal data collected in connection with the enquiry. The processing purpose is based on the legitimate commercial interest of helping you with your enquiry. Administration of your user account: Your name, e-mail address, user name and password. The processing purpose is based on the legitimate commercial interest of identifying our users and giving them access to a user account with their own credentials. We do not give out or disclose your personal data to others unless there is a legal obligation for such disclosure. Examples as to basis for disclosure could typically be a contract with you or legal basis in the law instructing us to provide out the information. 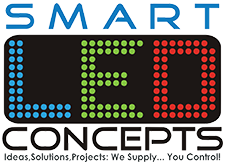 Smart LED Concepts uses data processors to collect, store or in other way process data on our behalf. In such cases we have concluded data processing agreements to ensure the information security in all segments of the data processing. We always make sure that appropriate and suitable safeguards compliant with applicable laws are in place to protect your personal data. This means that personal data collection based on your consent will be deleted if you withdraw your consent. Data processed for the purpose of our newsletter will for instance be deleted after withdrawal of your consent. Personal data we process in the performance of a contract with you will be deleted when the contract is implemented and all obligations pursuant to the contract have been implemented. Personal data related to your user account, including location data, is retained until you delete your account. Personal data related to shipment of packages is deleted after 2 years of last shipping date. Sensor data collected from your device is deleted upon your request. Smart LED Concepts secures your personal information from unauthorized access, use or disclosure. When personal information (such as a credit card number) is transmitted to other websites, it is protected through the use of encryption, such as the Secure Sockets Layer (SSL) protocol. Like most websites, our site uses “cookies” to store specific information about you and track your visits to our site.